INDICATIONS: No Sting Skin Prep is a liquid film-forming skin preparation that upon application to intact or damaged skin, forms a protective interface that helps prepare skin attachment sites for drainage tubes. 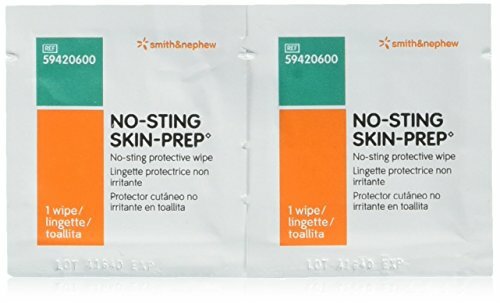 Smith and Nephew No Sting Skin Prep Wipes provide alcohol free protective wipes. It helps prepare skin attachment sites for drainage tubes, external catheters, surrounding ostomy sites and other adhesive dressings. Applies as coating that prepares the skin for adhesive. It is provides a protective interface that may reduce friction during the removal of tape. If you have any questions about this product by Smith & Nephew, contact us by completing and submitting the form below. If you are looking for a specif part number, please include it with your message.